We've been meaning to get the store open for a while at Sword & Sarcasm, and I don't know if you can call one item a store, but it's pretty nifty. 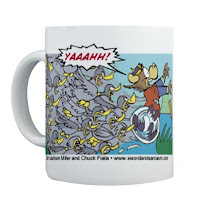 The "Nibbled to Death by Ducks" mug commemorates the half-minotaur Herbert's chaotic flight from the voracious birds of Jelron the Beige. The side caption, with logo, reads, "It Pays to Stay a Step Ahead of Life's Little Problems."